Why did Black 47 bomb in the US even though it is deadly? Black 47 is the first full-length feature film set during the Irish Famine. Which is strange. Because you’d think an event coming in a natty second to the Napoleonic wars for the greatest loss of life in nineteenth-century Europe would be a bit more represented. I mean, there’s about a million Horatio Hornblower movies. I thought it was deadly. I didn’t think I was going to think it was deadly, because there are zero women on the creative team and there’s only one female character, whose function is to die to provide pathos for the male protagonist. This is usually a recipe for my finest Oh No God Why feelings. Therefore, I will only move on to why I thought the film was deadly after I’ve pointed out that there were women during The Famine. They did a variety of things other than die so that their male relatives could be justified in murderous rampages. There were plenty of characters in the film that could’ve been realistically imagined as women if one were arsed to contend with the pesky historical fact of our existence. And hire women, for feck’s sake. If 100% of your directors, producers, screenplay writers, composers, cinematographers and editors are men, then, statistically speaking, you’re a massive sexist. I will now turn my feminisms off for the rest of this blog post. 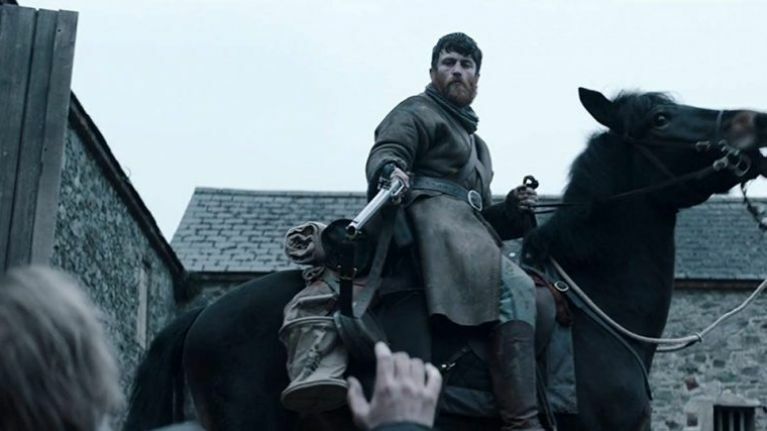 Black 47 uses a simple revenge narrative in which the wronged protagonist works his way through tiers of depravity before confronting a big baddie at the end. But it cleverly manipulates this structure to expose the layers of social coercion and oppression that lead to the devastation of The Famine. The Irish Constabulary enforcing barbaric tenancy laws; judges hanging and deporting people that needed help, not punishment; and squireens with their stores full of grain are every bit as much the enemy as the British Army. In Black 47, colonial oppression often has an Irish accent. But this doesn’t let the coloniser off the hook – Muttonchops the absentee landlord, on an administrative visit to his Big House, is the final target. He becomes the voice of many of the ideologies that bolstered England’s inhuman reaction to Irish suffering: laissez-faire economics; a doctrine of cultural and ethnic inferiority. For Muttonchops, “this potato business” comes as a blessing – the poor law allows him to evict his former tenants with impunity, and to maintain his economic bottom line by exporting grain while the people who cultivated it starve. Our red-bearded, brick shithouse of a hero is a former Connaught Ranger. He fought for the British overseas, apparently in the first Anglo-Afghan war. He admits to having done terrible things to people fighting for their homeland. He’s a man of few words and much head-chopping-offing, but when he does speak, it’s to reflect on the difference between murder and war, on what justice means in a place like Ireland in a year like Black 47. It’s impressive that the film dodges lazy binaries of English oppressor and Irish oppressed, that it recognises Irish complicity in empire alongside British brutality in Ireland. I also love the confrontational language politics of the film. The hero’s refusal to speak English is set against our historical awareness that the famine will be the death knell of Irish as the island’s majority language. That’s super affecting. It makes you feel some of the cultural loss of the famine, makes you remember that it wasn’t only people that died in Black 47. As an immigrant living in North America (though in Canada, not the US), here’s what I think. North Americans are fascinated by the famine, particularly as many of them have ancestors who immigrated in the period. But the narratives they like are the ones in which immigration is the right answer, in which the strong of spirit left and became prosperous while the weak stayed behind in the chains of oppression. Look at the Boston Famine Memorial, which I saw when in beautiful Beantown for the first time last autumn. A sturdy new immigrant family stride confidently and warmly attired towards the future, while the woman casts a look over her shoulder at the past, at the old country, at the starving Irish, wailing in rags. Whether the sculptor intended this or not, I read the look on the woman’s face as one of disgust. At best, it is a cold pity. There is certainly no admiration or pride in it. To my Paddy proclivities, the memorial is pretty tasteless. But, as I learned from a lecture by Margaret Kelleher last year, when confronted by like critiques by other Irish observers, the Boston Irish community passionately defended the representation. This was their famine story. Black 47 is a story about the heroism of those who stayed, and the closing shot – which invites us to choose between giving our lives to fight colonial injustice or escaping on a coffin ship – is really a choice between two deaths, one of self, and one of Ireland. So much of Ireland died when, in seven short years, one million people starved and up to two million emigrated. At home, The Famine can never be a success story. But it’s time to start representing it, in all its uncomfortable complexity, and to start looking over our shoulders with pride at those who took the soup, learned the Queen’s good English, and survived.